For the duration of their existence, the Incas lived in constant harmony with nature. They would therefore deify the elements that nurture mother earth – or as the Incas call her “Pachamama” – as gods. Amongst these, the life-giving sun was the most important. Reason enough for the Andean people to believe that the first Inca, Manco Capác, descended from the burning ball itself. Consequently, the Incas saw themselves as the children of the sun. This direct connection to sun god Inti also justified their self-conception as the superior culture on earth. In order to praise their creator, the Incas celebrated the annual festival of Inti Raymi. Inti Raymi, Quechua for “festival of the sun”, was the most important celebration of the Incas. The ceremony symbolically portrayed the mythical origin of the Incas and marked the New Year of the Andes at the same time. The shortest day of the year in terms of the time between sunrise and sunset symbolized the connection between humans and the sun god. For that reason, the colorful nine-day festival with joyful dances and processions took place every year on the winter solstice of the southern hemisphere. The location of the ancient celebration was the Huacaypata, the square of tears in the center of Cusco – at that time the capital of the Incan Empire. While it is basically a production today, Inti Raymi is still an extraordinary spectacle for locals and tourists alike. It is a definite once-in-a-lifetime experience that provides great insight into the believes and lifestyle of the ancient Incas and their descendants today. Three days prior to the Inti Raymi festival, the Sapa Inca – the Incan king – started a purification period. During these days, they were only allowed to consume water, uncooked corn and chucam. In the early morning of the winter solstice, they came together on the Huacaypata, their faces directed to the northeast as they awaited the sun rising on the horizon. As soon as the sun appeared, they would bow down and raise two cups of Chicha, the golden corn beer brewed in praise of the gods. While the left cup was offered to the sun, the right cup was shared amongst the Sapa Inca and his entourage. After this followed a march to the Coricancha, the location of the sacrificial ceremony. At the beginning of the celebration, a large golden disc with the symbol of sun god Inti was place inside the Coricancha temple. This was the most important of the many temples that the Incas specifically constructed to proclaim the sun. It was fully covered in gold and silver, the colors of Inti and his wife Mamaquilla, goddess of the moon. On both sides of the holy motif were two lion statues that faced the sun. Representatives from all corners of the empire had come to join the Sapa Inca in speaking prayers and giving sacrifices. Among these oblations were usually animals like llamas. However, in some cases even children were sacrificed to thank Inti and Pachamama in order to ensure a good harvest. Finally, the festivities would summit in the ignition of the “new fire”. After all burning fires had been extinguished throughout the city, the Incan king started a new fire with the reflection of sun light onto a golden mirror. A symbolic act that once again emphasized the power and importance of the sun. The first ever Inti Raymi happened in 1412. Over more than 100 years, the Inca celebrated their sun god in this annual festival until the Spanish conquistadores and the Catholic church finally banned it in 1535. After centuries of absence, Inti Raymi got a revival in 1944. Since then, a production of the original religious celebration has been taking place every year again in the form of theatrical performances. Nowadays, the celebration starts with a spectacle on Plaza de Armas, Cusco’s main square. From there, a procession leads to the Incan walls of Sacsayhuaman where the main ceremony takes place. The location, two kilometers from where the original festivities took place, is a 30-45 minute march by foot. Over the full distance performers carry the Sapa Inca and his wife on sedan chairs to the ruins. 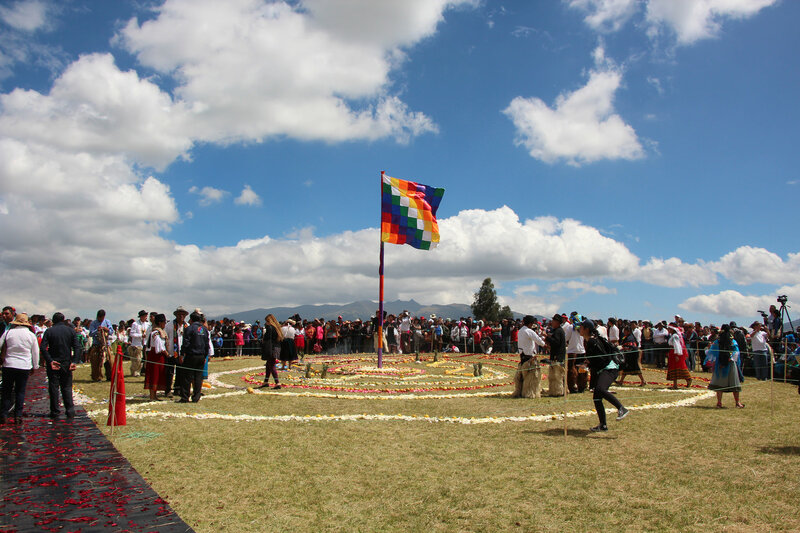 The next Inti Raymi 2019 will take place on Monday, 24th June 2019. Please keep in mind that lots of accommodations will be fully booked weeks in advance. And also room prices are generally higher during the days of the event. So being an early bird will definitely increase your chances to get the full experience. Tickets for the main ceremony in Saqsayhuaman are available from 151 US dollars but go up to 216 US dollars for top seats. Purchase your tickets here before they sell out! As a free alternative, Cerro Suchuna, the neighboring hill, comes in handy. From the top, you get an unobstructed view onto the premises. However, while you can get a great panorama, the distance doesn’t necessarily allow for seeing all details. Another aspect to take into account is that these spots will be occupied by locals. So unless you have somebody experienced to take you there, chances are small that you will actually catch one of the popular spots. In that case, we suggest you swallow the pill and get an official ticket. Like that, you can at least enjoy the event without any stress. Find articles on food and drinks from Peru here.